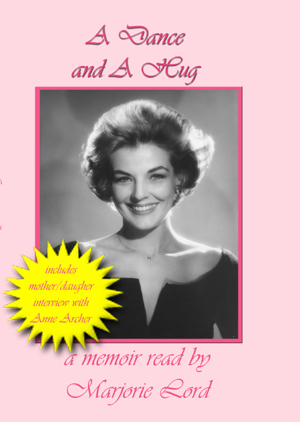 FanSource is pleased to offer Marjorie Lord's book A Dance & A Hug, and an audio version of the book, read by Marjorie, with a foreward by her daughter Anne Archer. Your book order will be personally autographed by Marjorie's daughter, actress Anne Archer. This book and audio CD were designed and published inhouse. Have a book or audio book you would like to have promoted on our website, or need help with designing and publishing your book? Contact us at inquiries@fansource.com. After a very successful first run, a new 2013 edition was released on Tuesday, May 28, 2013. This 2013 edition includes a complete episode guideline of all 11 seasons of MAKE ROOM FOR DADDY, including episode titles, episode airdates, guest cast and character names, synopises, along with comments from Marjorie about joining the cast, working on the show, working with some of the legendary cast cast and filming the last episode. This edition also includes Marjorie's film, television and stage credits. "To be an actress and breadwinner and still appease the men in her life brought back a flood of memories of this talented and courageous woman whom I'm proud to call my Mother." 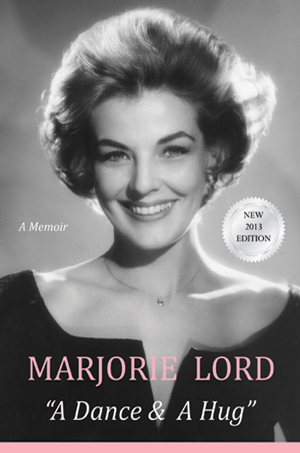 "Marjorie Lord - whose memoir reveals a woman of passion, commitment, integrity and extraordinary beauty." "Marjorie Lord has recently penned an excellent, fast-moving memoir, "A Dance and a Hug." The book chronicles the star's life, from small child to early success as a teenager on Broadway in "The Old Maid" through her varied career in films and television. Western fans remember her from "Masked Raiders" with Tim Holt--she being the leader of those Masked Raiders, as well as films with Wild Bill Elliott, Rex Allen, and TV oaters like Hopalong Cassidy and The Lone Ranger. It's a book I personally couldn't put down--I read it in one sitting! She worked with everybody from Wheeler and Woolsey to Bob Hope, Edward G. Robinson to Howard Duff. It's fascinating reading, and highly recommended." All FanSource visitor orders will be personally autographed by Marjorie's daughter, actress Anne Archer, and you also receive a specially designed bookmark to go along with your book. A Dance And A Hug audio CD is available at FanSource.com. This 5 disc CD audio set includes Marjorie's memoir, read by Marjorie, with the prologue and epilogue read by Majorie's daughter, Anne Archer. The CD box set also includes a special interview between Anne and Marjorie. As a special bonus to our FanSource.com visitors, we have a limited number of CD box set covers signed by Marjorie before she passed away on Nov. 28, 2015, which have also been signed by Anne. "With all she has gone thru in her life; and I mean All, I still felt so good after reading it. And, I could not stop looking at those pictures ! I had picked it up one evening; a bit sleepy, just to start it; to get into it. But of course I never stopped. Please do thank her for such a very special experience!!"